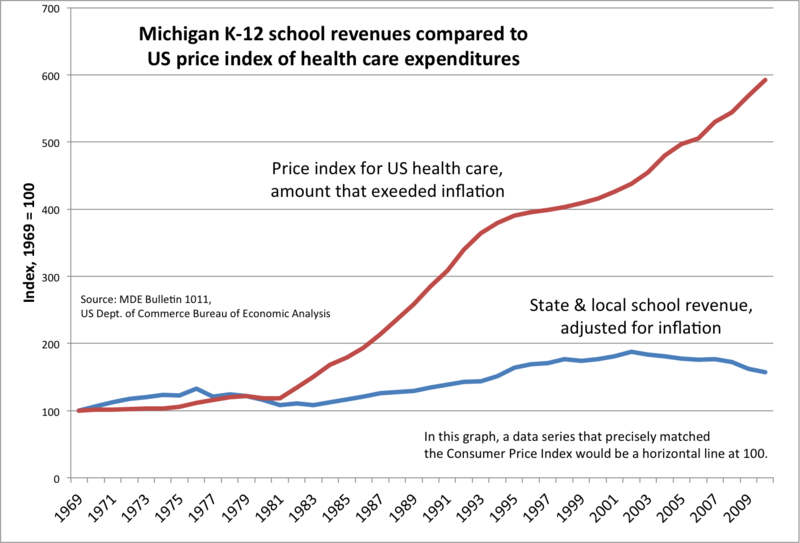 While looking for a class example recently I came across the graph above comparing Michigan K-12 school revenues with health care expenditures. In class, I displayed the graph and asked my students what they hear people blame for the rise of health care costs. They mentioned insurance companies and the uninsured. Then I asked them what they hear people blame for the rise of education costs. The first thing they mentioned was teacher pay. These reasons are given despite the fact that in the past 15-20 years teacher pay has barely outpaced inflation while physician’s salaries have increased a good deal more. The rhetoric surrounding both of these increases is fascinating because of how clearly it illustrates the low value we place on teachers and the work they do. I have heard similar claims about faculty salaries in the face of rising tuition (and decreased state support for public colleges and universities). While I am somewhat insulated from these claims by virtue of being at a private institution, the eroding value of teaching at all levels will undoubtedly affect all of us in the future. Finally, the poor job market for teachers and professors likely exacerbates these problems, since for every teacher or tenure track professor complaining about declines in benefits and take-home pay there are three claiming that they would be happy to work for even lower wages in exchange for stable employment.